Kagemusha (影武者?) is a 1980 film by Akira Kurosawa. The title (which literally translates to "Shadow Warrior" in Japanese) is a term used for an impersonator. 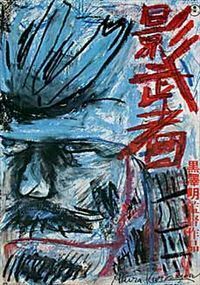 It is set in the Warring States era of Japanese history and tells the story of a lower-class criminal who is taught to impersonate a dying warlord in order to dissuade opposing lords from attacking the newly vulnerable clan. The warlord whom the kagemusha impersonates is based on daimyo Takeda Shingen and the climactic 1575 Battle of Nagashino.